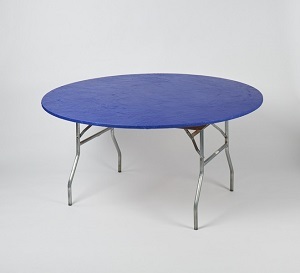 KWIK COVERS disposable and re-useable fitted elastic plastic table covers. medium weight fitted elastic table covers/cloths with elastic edging which holds the table cover in place. Kwik Covers are durable enough to be reused and affordable enough to be disposed of after a single use. 8 foot banquet - 30"x96"